We are nearly halfway through the school year, and that is when interest in homework and spelling list can wane for us. While we have enjoyed sight word swat, sight word toss and sight word salad we need some assistance with our spelling words. Cue the creative buzz that engulfed my brain a couple of weeks ago. My kids love to do craft, love painting, and it’s something that I have to be in the mood to do. This spelling game ignites the senses all while practising spelling words winning! There are two ways you can play this game, and both have worked for us. You need the same sensory bag of paint, here’s how you do it. Simply add a small amount of paint, about a 1/8 cup, into one of the snaplock bags. You need to be able to move the paint around so don’t fill it. Squeeze the air out and seal the bag. Secure the bag with some sticky tape. Insert the bag of paint into another snaplock bag. Again squeeze out the air, seal the bag and secure the opening with sticky tape. You’ve just made a sensory paint bag. 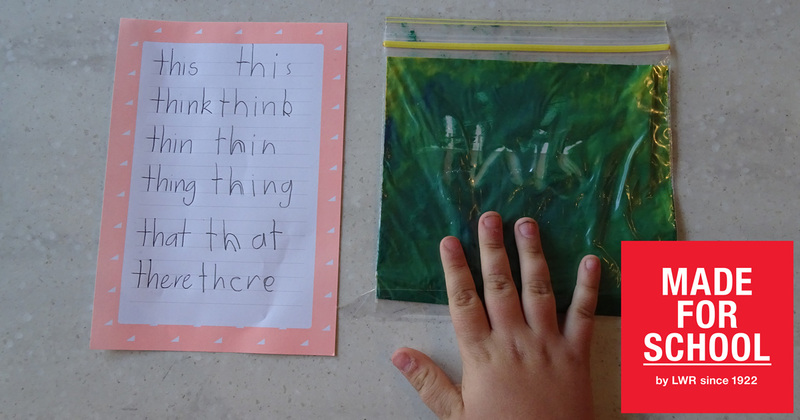 Once your child has written their spelling words for their homework, pull out your paint bag and ask them to write each word on the sensory bag using their finger. Once they have written a word, ask them to rub out the word and start with another word. Another way you can play this game is to write out the spelling words, or use sight words and sticky tape them onto the table or a placemat and place the paint bag on top. Ask your child to say and spell the word as they find it. I hope you enjoy some literacy fun with the kids doing this activity; it is easy and fun!